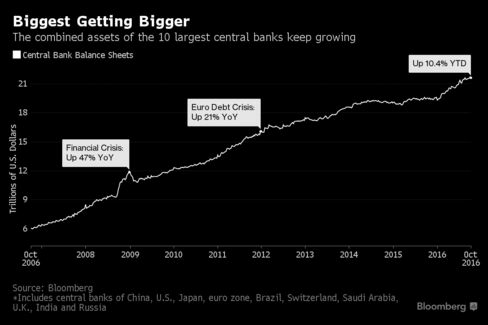 The world’s biggest central banks are bulking up their balance sheets this year at the fastest pace since 2011’s European debt crisis to boost lackluster economic recoveries with asset purchases that are supporting stock and bond prices. The 10 largest lenders now own assets totaling $21.4 trillion, a 10 percent increase from the end of last year, data collected by Bloomberg show. Their combined holdings grew by 3 percent or less in both 2015 and 2014. The accelerating expansion of central banks’ balance sheets comes as debate rages over whether their asset purchases and continued low interest rates are creating bubbles, especially in the bond market. Such quantitative-easing programs are aimed at driving up the prices of the securities they purchase to lower bond yields, encourage investment and boost economic growth.